Continuing the 12 Authors of Christmas, here’s author Veronica Heley! VERONICA HELEY has had 59 titles published so far, including crime and historical for adults, and many books with a Christian background for children of all ages. 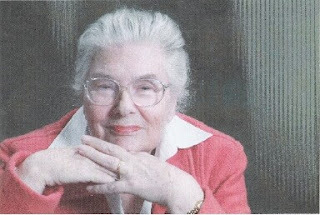 In her time she has contributed playlets for a telephone storyline, storyboards for cartoons, and book reviews and articles in the Christian press. Bible Reading Fellowship published her straight-forward biography of St Paul – WHO, ME? PAUL – and STORIES OF EVERYDAY SAINTS, a resource book for those working with children. She is currently writing the Ellie Quicke Mysteries for HarperCollins and Severn House - most of this series are already in hardback, paperback, large print and audiobook. Ellie is a feisty, fiftyish widow who solves crimes in the community by networking with friends and acquaintances, while dealing with her own family problems – particularly an ambitious, unpleasant and greedy daughter! The ninth book – MURDER IN THE PARK – comes out this December, and she has to deliver the mss of the second in the Abbot Agency series by January lst, 08. Veronica enjoys giving talks and workshops, attends a Methodist church, and reads and gardens for relaxation. She is married to a retired probation officer and lives in London. She has one musician/teacher daughter who is married and living in Leeds. Visit her website – www.veronicaheley.com to find out more about her and her stories. Dec 07, MURDER IN THE PARK, 9th in the Ellie Quicke mysteries. July 08, FALSE PICTURE, 2nd in the Abbot Agency series. All from Severn House Publishers. When I was six months old, my parents bought a small artificial Christmas tree and hung it with tiny baubles. Seventy years on, I still bring that tree out at Christmas, though it now requires careful handling and a spot of Do It Yourself to keep it going. Before WWII my parents toured in Europe every summer, bringing back blown glass baubles to hang on much bigger, real, trees. Some of these have survived intact, though many have to be hung with care as they are very fragile. When I started to travel in the 50s, I bought Christmas baubles from Scandinavia, Austria and Belgium. Nowadays I restrict myself to buying one new bauble each Christmas. My husband’s parents died relatively young, and he can’t remember having a tree when he was growing up, so now he insists on having the largest tree he can fit into our house; it takes ages to decorate. He puts on the lights and the angel/fairy atop the tree, and that’s his lot! I put off hanging up all the cards we are sent till the last possible moment. I think I must be slightly claustrophobic! I design and make all my own cards – each year I think to myself that I’ll never be able to come up with a new design, but somehow or other it gets done. This is a tradition I sometimes wish I’d never started! What I do enjoy playing with is the Nativity set we bought in Prague, which goes on the mantelpiece next to a candle in a holder. I like to move the figures around to match the Christmas action. My mother was a good pianist, and we all used to stand around her at the piano and sing the first verse of umpteen carols when we were younger. Later we went carol-singing for charity round the neighbourhood, with candles in jam jars, tied on to bamboo sticks to light our way. It was a point of honour to sing at least two verses of every carol at each house, and not just half a verse and rap on the door as is more often the case nowadays. My favourite carol is The Shepherd’s Farewell by Berlioz, calculated to tear me up every time. I love harmony in voices. I live in London, Great Britain. We used to see snow in the old days, but global warming has banished that. Ours is a built-up neighbourhood centred around a tree-lined street with sixty shops in it. The lights are switched on in these trees at the beginning of December, and I like to do my shopping after four in the afternoon when the lights are on – it’s quite magical. I suppose that’s our nearest equivalent to American mall shopping. In the old days on Christmas Eve afternoon we used to hold Open House and serve home made cakes and tea. All the neighbours and friends used to come, and there was never a spare seat in the house. Now we go to bed early and attend church on Christmas morning instead. Love is all round us and overflowing to others at that service, and walking through the streets afterwards, we greet strangers as friends. Turkey with a chestnut stuffing and Christmas pudding is the usual fare for Christmas Day over here; we take it in turns with another family to host the big meal of the day though we usually skip Christmas pudding in favour of a cheeseboard…and then we take a leisurely walk in the park nearby before having a smidgeon of cake for tea. Personally I like chunks of cold turkey, egged and breadcrumbed, fried up next day with bacon, onion and bananas. Yes, bananas! Try it some time. Christmas Eve…there is a hush in the big, shadowy church just before midnight. A boy soloist lifts up his voice, singing Once In Royal David’s City. Solo. No organ. It pierces the heart. Camy here: Thanks for sharing, Veronica! After 24 years, shes learning the truth that was hidden from her as a child. Now the fate of many people depends on what she will do with it. At the age of four, Araminta “Minty” Cardale was exiled from Eden Hall on the wings of a scandal. Twenty years later, summoned by her half-sister, she has returned to see her dying father. But her hopes of a warm family welcome are shattered, and she is rejected once again. 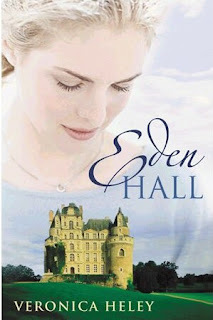 Making a place for herself in the village at the gates of Eden Hall, Minty begins to learn the truth about her father and her long-dead mother. She has yet to understand the threat she represents to family members who care only for money, power, and self-advancement, or the hope she offers to the community she is growing to love. And there are some who will do anything to prevent her finding out until its too late. Thankfully, Minty has friends to stand by her, and, in this modern Cinderella story, she find an unlikely and unpredictable champion. At stake are the soul of her father on his deathbed and the future of the entire village. Good to see the English Chrismas mentioned. We have some of the old glass ornaments about 50 years old and they have become quite fragile. one broke about 2 years ago which was sad. your memories are great to read and i can imagine Once in Royal david city song as a solo with our music would be beautiful. thanks i enjoyed reading what you posted.